This time on Best Book Ever, we're talking about books you never thought you'd love. Do you have a book you ignored because it was trendy, only to fall in love with it when you finally gave in? Did you hate fantasy until someone made you read Lord of the Rings? Was there an assigned reading in school that made you roll your eyes, up until you devoured it in one night instead? Tell me about that book! Check out our selections and let us know what you think in the comments. 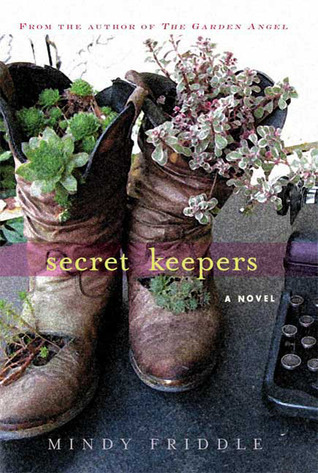 I never would have picked up Mindy Friddle's SECRET KEEPERS on my own. The cover displays a pair of boots re-purposed to hold potted plants, and it's clear from reading the blurb that gardening plays a large role in the plot. Um, yeah. I loathe gardening, and I kill every green thing that I touch. But when a friend sent me an ARC a few years ago, I decided to read the first chapter to see if it would hook me. It did. I couldn't put it down, and I fell in love with the characters who narrated the story. Instantly, Friddle made me relate to an elderly woman, a teenage boy, and a soccer mom with a shopping addiction. I recommend this book as often as I can, and I'm so thankful that my friend sent it to me. One book I love that I never thought I'd love is LIFE EXPECTANCY by Dean Koontz. Initially, I was taken aback when a friend of mine recommended it. Horror is not my go-to genre (or wasn't at the time) and I'd largely avoided Koontz based on the assumptions I'd made about the content of his stories. Okay, what I'm trying to say here is, I was a big chicken (*bwok bwok*) and didn't want to risk any book-induced nightmares. (This is no longer the case.) 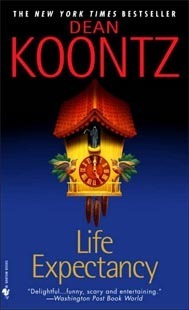 So I didn't read Koontz…until I read LIFE EXPECTANCY and was completely blown away. The book wasn't anything like I'd imagined it would be. It was mysterious and quirky and weird and wonderful. I couldn't put it down. I had to know how it ended, but didn't want it to end. It is a marvelous thrill ride of a read. In fact, writing this review makes me want to read it again. I never thought I'd love LIFE EXPECTANCY, but I do. I hope you'll read it and love it, too. 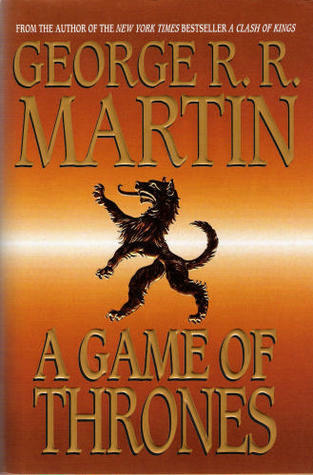 I had to think about this one for a little while, but I'm going to go with George R. R. Martin's Game of Thrones series. I'd been aware of the books for a while because of friends online who loved them, but I always had a difficult time getting into epic fantasy, especially epic fantasy of the still-ongoing-series types. I usually like my fantasy a little lighter and less life-consuming. Eventually I gave in, though, because I wanted to experience the story for myself instead of having them filtered through my friends. I'm glad I've read them, as Martin's really created an interesting world. The books aren't without their problems -- when I was reading A Dance With Dragons, I kept a running liveblog that was mostly me complaining about it -- but they are entertaining, and I have absolutely no clue how the books are going to end. If they ever end. Ever. Maybe. In school we had to read The Great Gatsby, and since it was a school book I thought it would be super boring, but I ended up loving it! Feel the same way about A Game of Thrones. Absolutely loved it. Currently reading A Clash of Kings but I've heard that the books have some issues that I'm not anxious to encounter. When I was growing up, my parents has in their bookcase for years THE FRENCH LIEUTENANT'S WOMAN by John Fowles, which was a bestseller in the 1960s, I believe. I never picked it up. Long after becoming an adult and living in my own home with my own bookcase, my mother wanted to clean out her bookcase and gave me loads of books, THE FRENCH LIEUTENANT'S WOMAN being one. After it sat in my own bookcase for another year, I finally picked it up and gave it a try. What a great book! Read it.